‘Hair’ is Little Mix’s next US single. Here’s how you can get it to number one. – MP! ‘Hair’ is Little Mix’s next US single. Here’s how you can get it to number one. Despite conquering the single charts in the UK, our baes Little Mix haven’t had as much luck in the US. Only two of their singles have charted so far, ‘Wings’ got to number 79 and ‘Black Magic’ number 67. The US just don’t love them like we do and their amazing tunes are doomed to remain secret love songs unless we take action NOW! Don’t let Perrie spiral into despair. So here’s the deal. 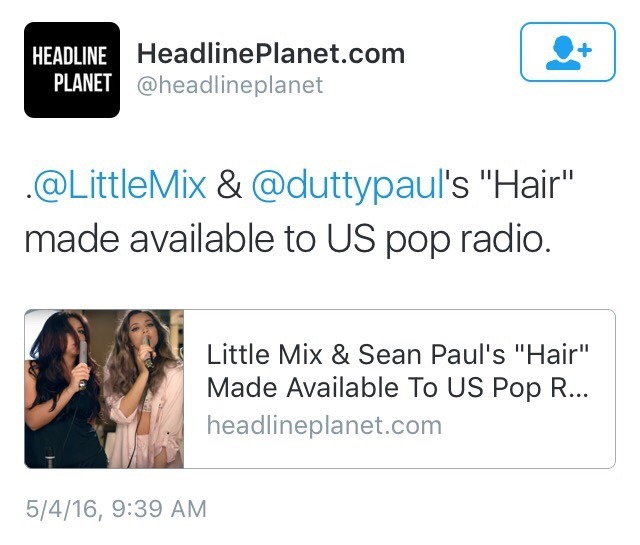 Little Mix’s new single ‘Hair’ has been released to pop radio in the US. ‘Hair’ could be Little Mix’s biggest hit in the US with a little help from us, but we need to work hard to get them to the top. So all the Mixers in the world need to join together and request ‘Hair’ to make it rise up the airplay charts. The awesome Request Little Mix Tumblr has helpfully put together all the details, so follow this link for details on how to request HAIR on US radio. If we work together, we can give the girls the massive US smash they deserve. Tweet us @maximumpop with the hashtag #makehairahit if you support this cause. Next article Quiz: Which geeky romance should you read next? Quiz: Which geeky romance should you read next?